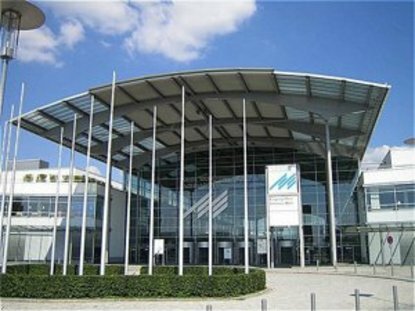 The Hotel Express by Holiday Inn Munich Messe is a modern business hotel located within easy reach of the Exhibition and Congress Centre Messe Munchen (ICM), Munich Airport (MUC) and the Allianz Arena. With direct access to the A99 / A94 motorways the hotel is perfectly connected to all business and leisure attractions in Munich. The Hotel Express by Holiday Inn offers accommodation during exhibitions like Materialica, FISITA, EANM or Systems. It is also a perfect place for your stop-over to vacation in Italy, Austria or Croatia. Alps. The Hotel Express by Holiday Inn offers 120 comfortably furnished rooms with chargeable High Speed Internet Access, air condition, satellite and Pay TV, complimentary tea and coffee maker, ensuite shower and hair dryer. The hotel features non-smoking floors as well as easy wheelchair access. We invite our guests to enjoy a complimentary continental breakfast buffet to get the day off to a good start. To guarantee a successful meeting, the Hotel Express by Holiday Inn Munich Messeoffers two modern conference rooms with natural day light and wireless LAN for up to 40 guests. Our parking garage offers room for 97 vehicles. Upcoming events in Munich include the exhibitions ExpoReal, EANM or the Oktoberfest &reg reserve your room directly online with our Best Rate Guarantee.